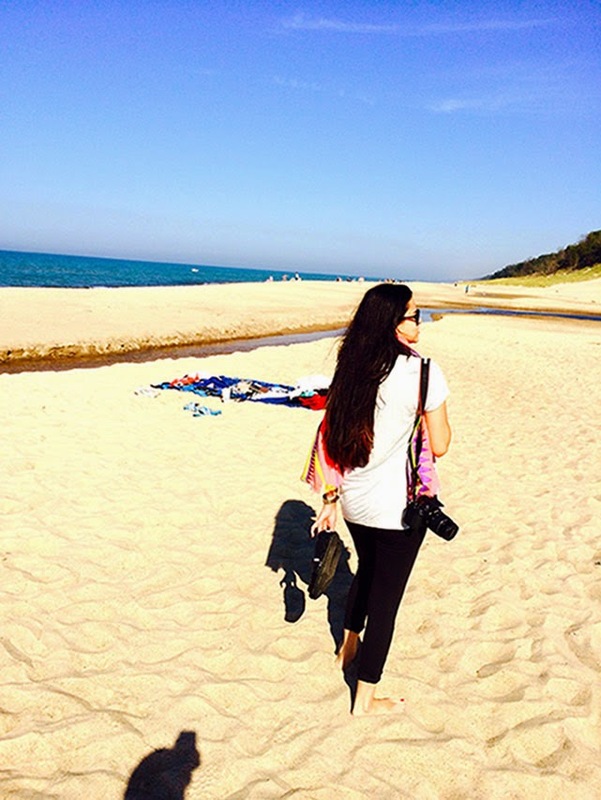 Miss Singh: SAND DUNES, A BEACH AND MORE! SAND DUNES, A BEACH AND MORE! It feels great to be back home but because of my last two months of traveling, I craved a small getaway last weekend. I wanted to go somewhere close by and where we could drive to, which is why we chose Indiana Dunes. I know, I know, there isn’t much in Indiana, but when I heard about sand dunes, a beach and a small- town country feel, I was up and ready for a road trip. After a short ride away(about an hour), we got to the hotel, dropped off our bags and set off for our sand dunes adventure! Our first stop was the beach. It was amazing and something like I had never seen before. So calm and quiet and just a few people around. We just relaxed and walked around, and took in the gorgeous view and weather. The best part of the beach was that you could literally see Chicago from that point. It wasn’t close, but we could see a glimpse of the beautiful tall buildings. It was a perfect view, the water in front of us and large sand dunes at the back. After relaxing at the beach it was time to get that hike on! We ended up climbing a few dunes and checking out the views! Trust me people, walking up the sand dunes was no joke. But it was fun and overall, a great experience. I have never seen such huge sand dunes and walking up them was an experience that I can never forget…something truly unforgettable. I should have been in better hiking/walking dune gear, but I still enjoyed it! After all the walking, I was hungry! I needed some food in my tummy, which is why we decided to go to an apple orchard, County Line Orchard. We didn’t plan on doing this before and ended up missing the scheduled apple picking time, but we still got a chance to go visit the orchard store and bakery. They had a wide variety of sweets that included fresh pies, fudge, cookies, caramel apples and of course, my favorite, donuts. Did I just say DONUTS?? I love donuts and once I heard that there is an orchard with donuts being prepared fresh, right in front of me, I’m jumping on that! They had two flavors and we had to get both! Apple Spiced Donut – dusted in cinnamon and sugar and Pumpkin Spiced Donut – glazed with pumpkin frosting (I’m drooling at this moment). We ended up leaving with some fudge and a fresh pumpkin pie for later. Whew!!! Sugar madness!!! The next day, we went to Chesterton's European Market. I had heard a lot about their art show and the food, so I had to go and check it out. The market was filled with artisan breads and pastries, boutique creamery cheeses, ethnic foods, meats, spices, oils, rare books, clothing, accessories, jewelry and fresh-from-the-farm produce and flowers. I was all over the cute jewelry stands, but one that caught my eye was the Charmed Chick personalized booth. They had a ton of charms, with lots of bracelets and necklaces that you could add the most adorable charms too. A cuter and much more affordable Pandora and the owners were so sweet. I had to get one!! There were the cutest booths of fresh honey, pastries, candles, granola and so much more! Then it was time for some food, food and more food!!! First stop was some fresh soda and bubble tea in a variety of refreshing flavors. For food, we chose the places with the longest lines, which included Ben’s Soft Pretzels and the Rolling Stone Baker. Everything was being made right in front of us, which was the best part about eating at this market. Rolling Stone Baker is probably my favorite though. It is a vintage Studebaker truck that prepares wood fired pizza in front of you in an oven, right in the truck. Such an incredible idea and the pizza was even better! We got their famous and signature Purple Pig pizza, which had some slow roasted pork, topped with provolone, mozzarella, barbecue sauce, cole slaw and some balsamic vinegar. (Did that just make you hungry?) A pizza/pie I have never tried before and it wasn’t just plain delicious, it was something different and just heavenly. I ended up getting a soft pretzel that was huge and absolutely delicious too. Not only was the food amazing, the best part about the market was the art show. There was a whole section dedicated to art that showcased many artists fun and unique work. There was also a competition where artists competed by drawing with chalk on the streets. Their work was just exceptional. I think the farmer’s market/art show is one of the hidden gems of this little town. The artists were amazing, the food, the people and just the whole atmosphere was fun and incredible. I highly recommend Indiana Dunes if you are in the Chicago area or in the Midwest! It is small, but a day or two is perfect if you need a quick getaway from the big city! It was a great trip that I will always remember and one that I am glad I could take you guys along! Follow my blog above and my social media(linked on my blog) to see what I’m up to when I’m not blogging! Loved this post!!! I especially loved the chalk artwork...your pics were awesome as usual!!! Brilliant job miss singh!!! Michele, thank you for reading and hopefully I will be down there again! :) It was nice to meet you too!